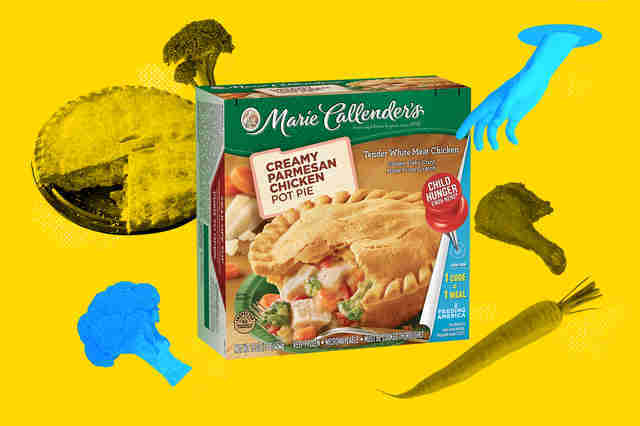 Frozen meals have come a long, long way since the advent of Hungry Man. Nowadays, the frozen meal section can look a lot like a freeway exit sign pointing you to your favorite chain restaurants, a smorgasbord of entrees and sides from recognizable restaurants you can make at home, far from the crowds... and at a fraction of the price. Trouble is, not all frozen restaurant goods stack up against the real deal. Yes, the frozen California Pizza Company options are fine and dandy, but they taste nothing like the real deal. 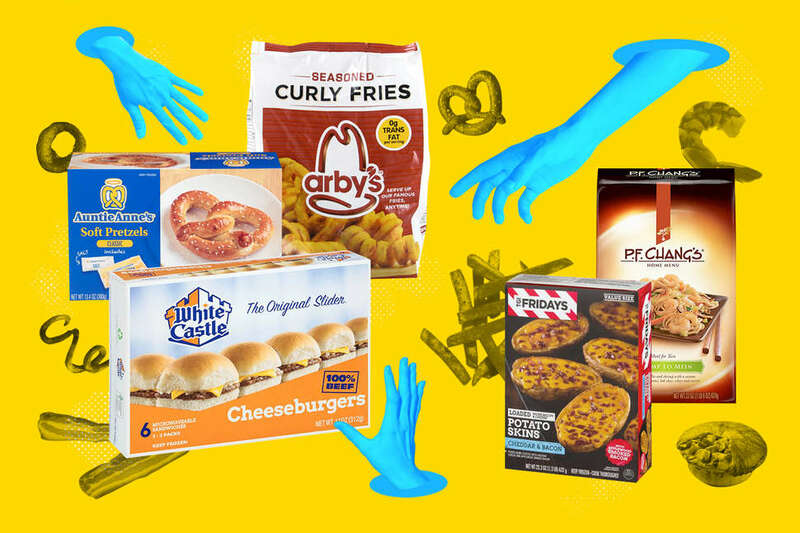 And some are downright gross: frozen meals that carry a brand name and nothing else. To help you make smart choices (or just lazy ones), we dove into the world of frozen goods to pick out the ones that stand tall beside their restaurant counterparts. No tips required. 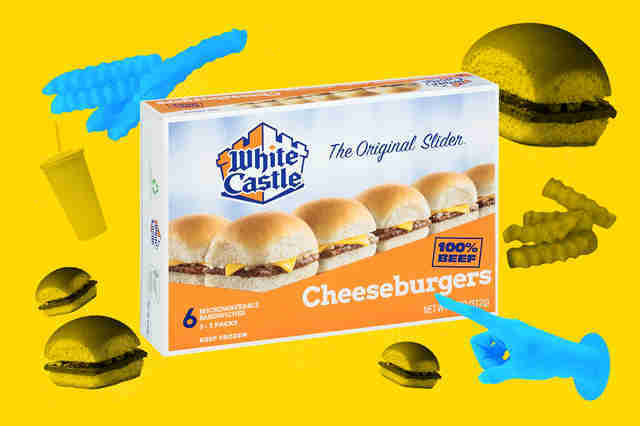 There are those among us who would say White Castle isn’t the pinnacle of fast food. Those people are idiots... idiots who representing a large majority of the population, but hey, here we are. But even among the die-hard aficionados of square, five-holed burgers by the case, the thought of reheating a brick of frozen Whiteys is suspect. You poor, miserable fools. If you do it right, the frozen versions can actually come out as good as, if not better, than the real deal. Skip the microwave and put those weird little suckers in a broiler pan with about an inch of water under the grate, cover with foil, then pop them in the oven. After that, they will be the exact same burgers you and Super Nintendo Chalmers crave. The absolute best French fries in fast food -- sorry, Ronald -- are now available in your grocery store freezer, and it turns out they’re an abomination if you cook them in the oven. But hey, guess what? So is every single frozen potato on the market. Because baked French fries are nothing but limp, soggy, flaccid sticks of disappointment, unless you’re particularly nostalgic for prison or elementary school. But fry them? You’re entering a whole new world of delicious. 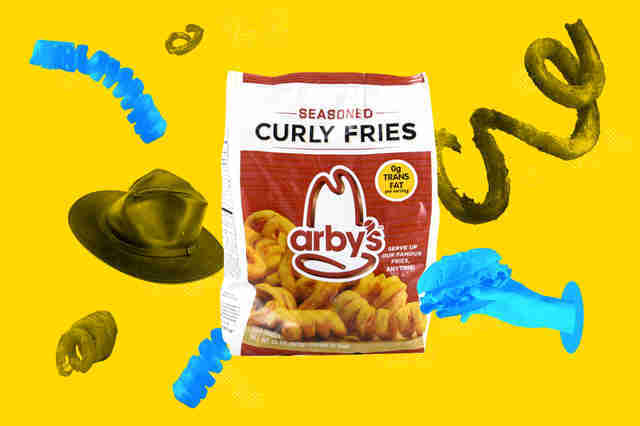 When combined with a deep fryer or a pan of oil, Arby’s curly fries taste exactly like they should: crispy, aggressively seasoned, and neon. If only they sold that Cheddar sauce for dipping. A favorite of octogenarians throughout the heartland, Marie Callender's is a comfort food emporium specializing in country-style cooking for the 3pm dinner set. And while many of Marie’s entrees can be found in the grocery store freezer and serve as perfectly OK supper options -- roasted turkey dinners, Salisbury steak, and meatloaf are bangers... not so much chicken fried steak or the inexplicable sweet & sour chicken -- the pot pies, well, they’re something special. These things are enormous, loaded with enough gravy to fill a mug and packed thick-cut carrots, peas, and chunks of meat. And the buttery crust is is a knockout. It’s the pinnacle of cold-weather comfort food from the freezer, served as gigantic single-serving pies or full-sized versions that are meant to feed a family, but also function well as single-serving, depending on the day. Make all the jokes you want about flair, but don’t you dare throw shade at the innovation Fridays wrought when they invented the loaded potato skin back in 1974. The hallmark of the appetizer menu is also the hallmark of the restaurant’s frozen snack line, whose mozzarella sticks should definitely be ignored in favor of this version of the potato skin, which matches the restaurant in almost every way except the fact that they’re not endless when you make them at home. 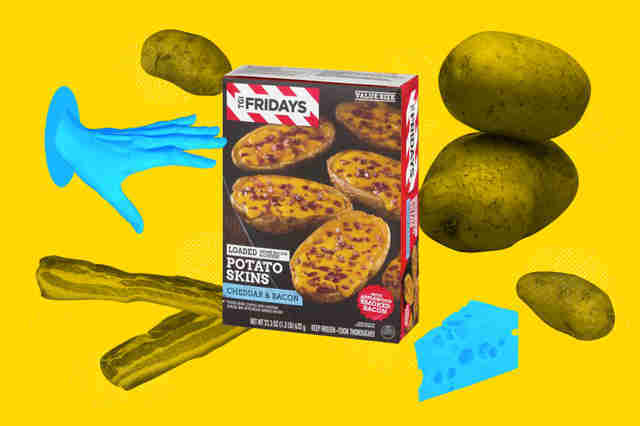 And while we’re on the subject of the magic Fridays wrings out of potato waste, the brand’s potato skin snacks are a dark horse for most underrated bagged gas station snack. Just saying. 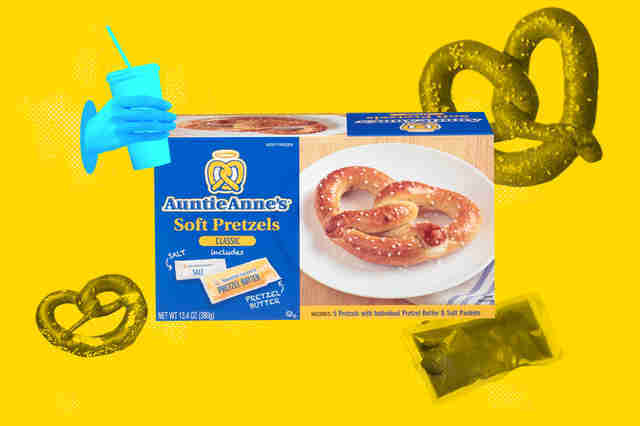 Like a classier Wetzel’s Pretzels, Auntie Anne is a favorite of mallrats the nation over, a soft pretzel loaded with butter that explodes with nostalgia. Ever the entrepreneur, Anne has launched a whole line of delicious frozen pretzels that, prepared in the oven or toaster oven, actually taste like smaller versions of the fresh version, and are definitely better than the ones that have been sitting in the rack of a kiosk all day while some stoned teenager texted her friends all day instead of making fresh ones. The pretzels even come with a little packet of butter and salt, though the questionable nacho cheese sauce would be welcome, too, especially the pretzel dogs, which, let’s be honest, are questionable no matter how you obtain them (get the Hot Pocket-style pretzel sandwiches instead). Even better, you don’t have to go to the mall to get them. You have to go to Target, though, so there’s that. The fancy mall Chinese chain has thrown a lot into the wok that is the grocer’s freezer, from its pork dumplings and egg rolls to its coveted orange chicken. As a general rule, though, anything that’s best consumed fried should be avoided as a frozen entree, especially given the presence of veggies and sauces means you can’t MacGyver it into a home fryer without things going spectacularly wrong. That’s why the lo mein options are clutch if you want some Chang's but don’t want to consume it while gazing at a Crate + Barrel. 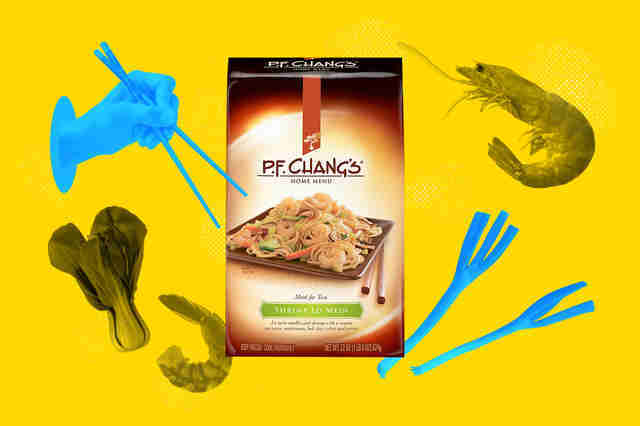 The shrimp’s the best, with plump shellfish and surprisingly crisp bok choy coming to life when you toss them in a pan with the perfectly slurpable noodles. The chicken, too, does the trick, but come on. You’re eating P.F. Chang’s, so you probably want to pretend you’re being fancy, even if you’re doing so while sitting alone on your couch. 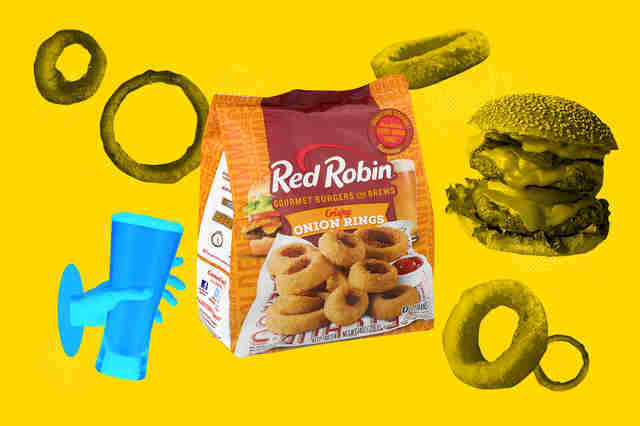 Let's be real here: Red Robin is famous for burgers, but you're really there for the onion rings. And the bagged version is perhaps the best frozen onion ring on the market, nailing that crunchy breading and packing those thick onions that always threaten to dislodge and smack you in the chin, leaving a totally-worth-it telltale burn behind. Even better, you can always throw them on a homemade burger to replicate that Red Robin magic, minus the screaming kids and hooch-swilling happy hour crowd. 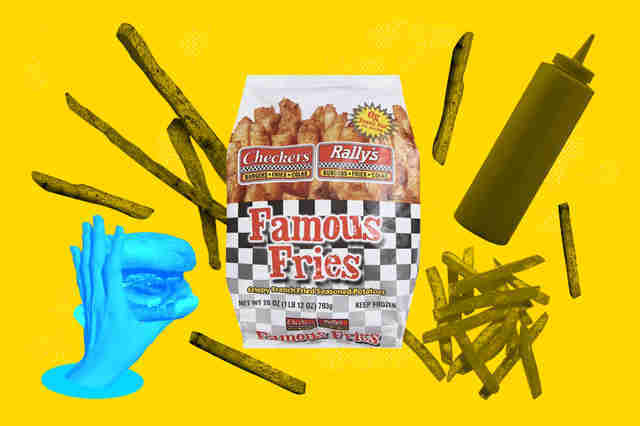 A late-night drive-thru favorite and go-to quote for aficionados of deep-cut OutKast references, Checkers/Rally's seasoned fries are the kind of thing that patrons will forever crave once they've had their first taste. Trouble is, the further out of the Southeast you get, the harder they are to find. Which makes finding them in the freezer of a grocery a revelation. As a bonus, once you score them (and fry them... for the love of God, don't make me go over this again), you can pair them up with burgers that are actually, you know, good. Go 'head and marinate on that. Andy Kryza is a senior editor at Thrillist who should really stop applying Atlanta-based rap lyrics to food writing, but dammit, Migos makes it too easy. Follow him to frozen stir fry @apkryza.